Since 2003, Jeff Pastorek has worked with gouache and ink on chipboard and, more recently, on BFK paper. His work focuses on the banal, confusing, and delightful experiences of human existence. Most recently he has changed his focus from humorous vignettes revealing intimate, fleeting moments to orderly grids of portraiture depicting heads of humans and animals. The portraits retain the humor and intentional awkwardness of the earlier chipboard work, but restrict the format to a rigid—almost scientific—format in order to shift focus on the faces and their relationship to one another. The resulting pieces contemplate how humans express their emotions or desires, evolutionary intrigue, the place of humans in the animal world, and the idea of place more generally. More information can be found at his website: www.jeffpastorek.com. LIKE: cat’s cradle, bone black ink, science fiction, digging, cryptography, head’s-up pennies, tuxedo cats, mysticism, rope, satanic symbols, flowers, smoking, leather, marbles, rubble, and privacy. LIKE: floating feathers, lamps, a thick New Orleans accent, traveling by waterways, alchemy, yarn, songs of praise, fireworks, siblings, beards, tall trees, cornfield sounds, mowing a lawn, long braids, pet of the week, and rope swings. DISLIKE: city fears, small-town fears, fears of the wild, fear of the paranormal, natural disasters, doubt, being attacked, family fights, scary shows, cat calls, allergies, dirty teeth smell, the devil’s hour, censorship, and even numbers. 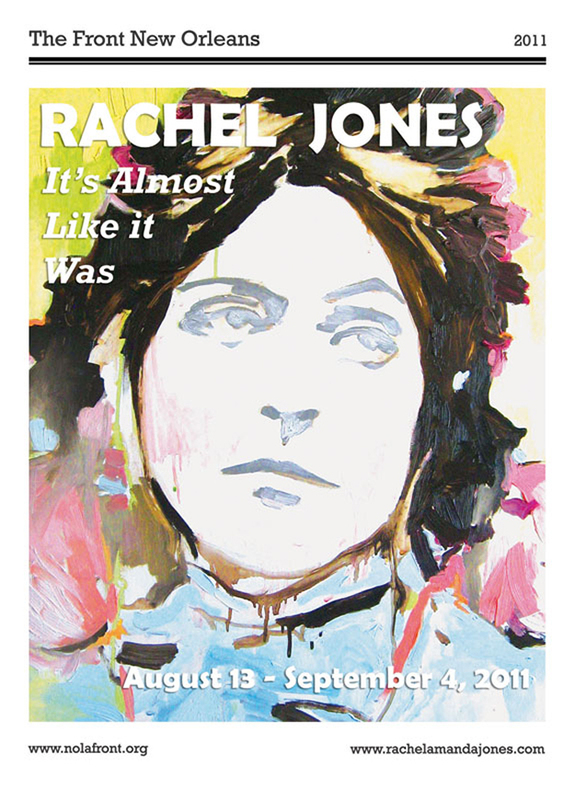 New Orleans based artist and Front member, Rachel Jones presents an exhibition of new work that includes paintings, drawings, and installations. The works in It's Almost Like it Was reference Romanticism, sentimental recollection, and the language of painting.